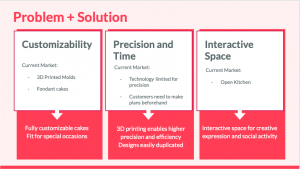 In today’s world, customization and personalization have become a heated trend. 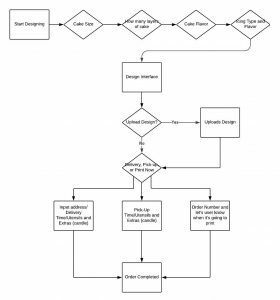 Not only shoes, clothes and bag designs allow customization option, food industry has widely accepted this new idea as well. During my study away year at NYU New York, I had many good experiences customizing my own salad or pizza in my everyday life. As a dessert lover, I have long wished to customize my own coffee and cake. At the same time, I have become obsessed with 3D technology since my second IMA class in my sophomore year. I have taken two more IMA classes related to 3D technology in New York. 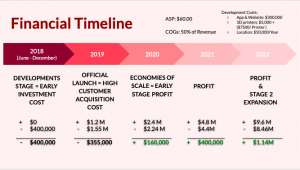 I not only had a better idea of the technology as well as the information-sharing online community related to 3D, but also was able to envision the broad application of the technology in all different industries. The classes enabled me to realize the possible combination of my two interests to focus on the implementation of the technology in food industry. My initial idea was to create the customizable latte art with the milk foam on the top of the coffee. During my research, I found an Israel company called Ripples has already made a breakthrough in this field. 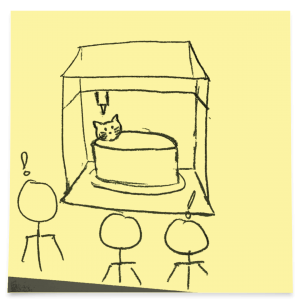 However, the coffee art only consist 2D design, while a cake could naturally provide a 3D design base. 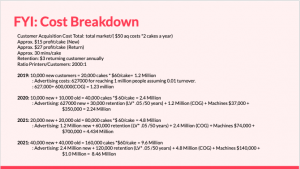 As a business major student, I have continued to push forward the 3D cake idea in the Entrepreneurship class at NYU Stern, and my business plan was selected by the judge investors among other 50 peer students. 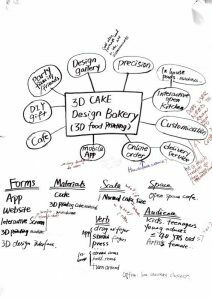 The idea I have in mind is to open a 3D cake design bakery that allows customers to customize their cakes using 3D modeling apps on mobile phones and tablets. 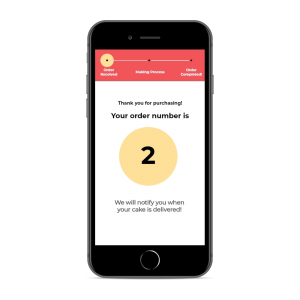 The bakery allows online ordering as well as in-store interactive experiences. 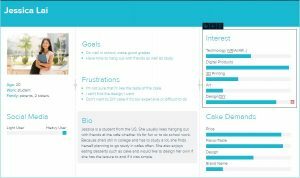 One major form would be a 3D modeling App that is very user-friendly. 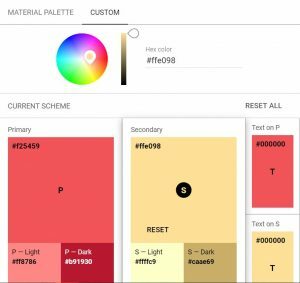 The interface would be similar to Tinkercad website. The users could simply use their fingers to drag the basic 3D objects (cubes, balls, characters, texts ,etc.) to the working surface (the 3D cake model), scale them and change different colors and shapes. They could also use these basic shapes to design their own characters. 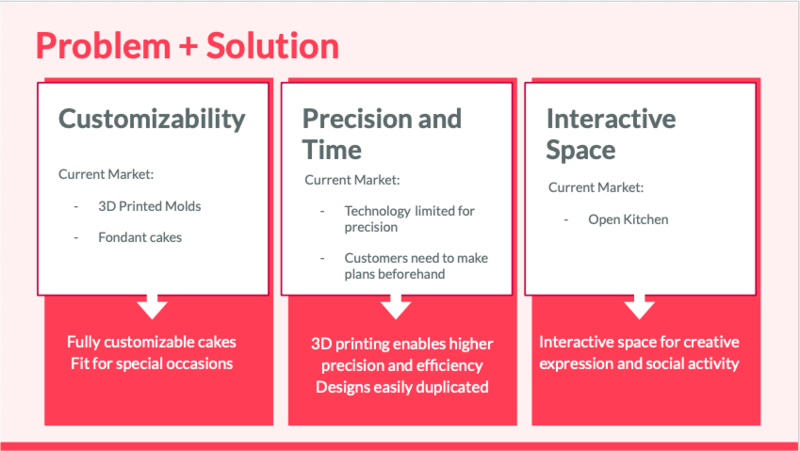 The bakery would have an interactive open space for customers to actually see their cakes being printed from the 3D printers. 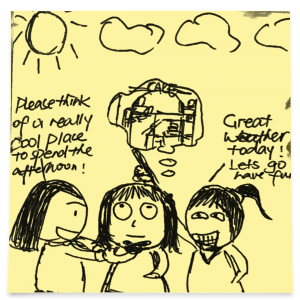 There would also be an interactive projected screen for customers to upload their own designs and vote for the best design. It was a beautiful weekend afternoon. 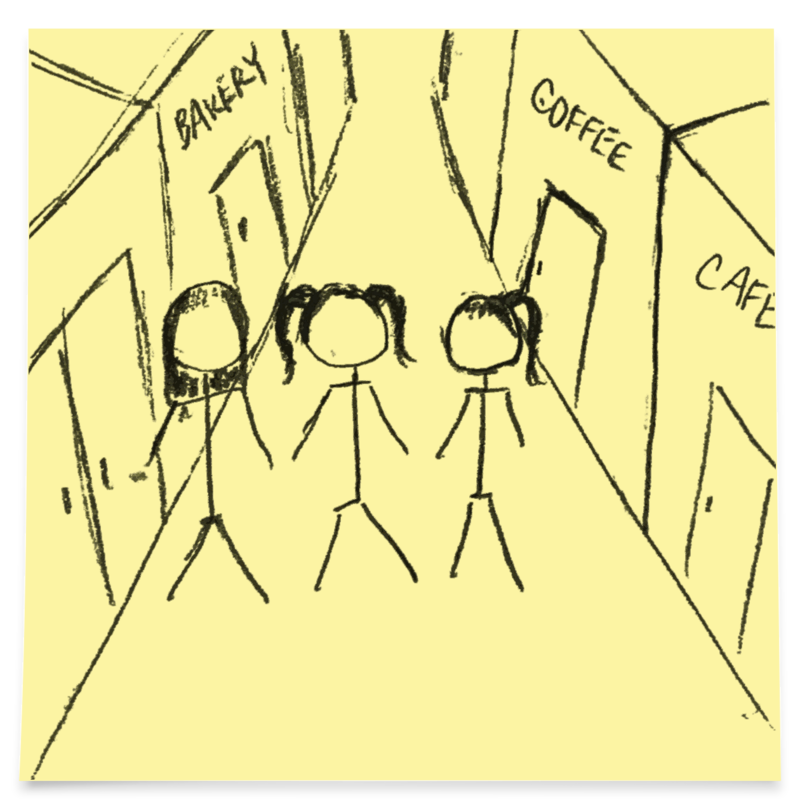 Three best friends Amy, Lisa and Catherine were walking aimlessly on the street. 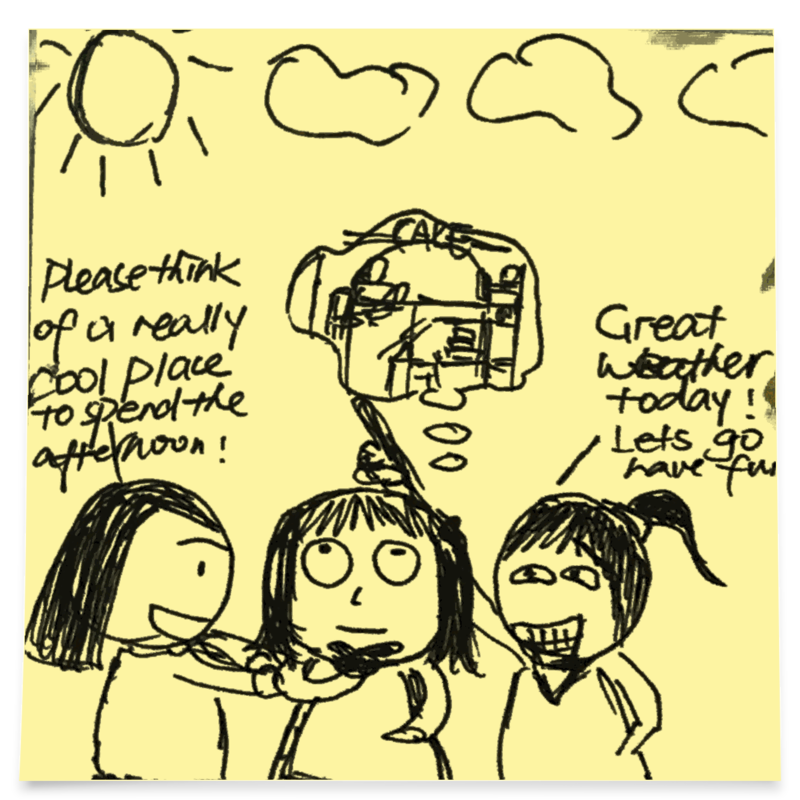 Since they were the coolest girls at school, they decided to go to some really cool place to spend their afternoon. Somewhere they could take very attractive pictures and post on Instagram. 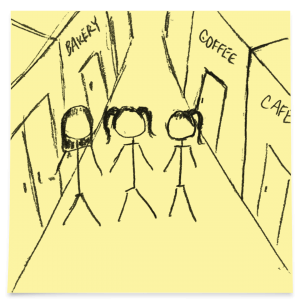 Lisa recently heard that a new bakery opened nearby. They decided to give it a try. 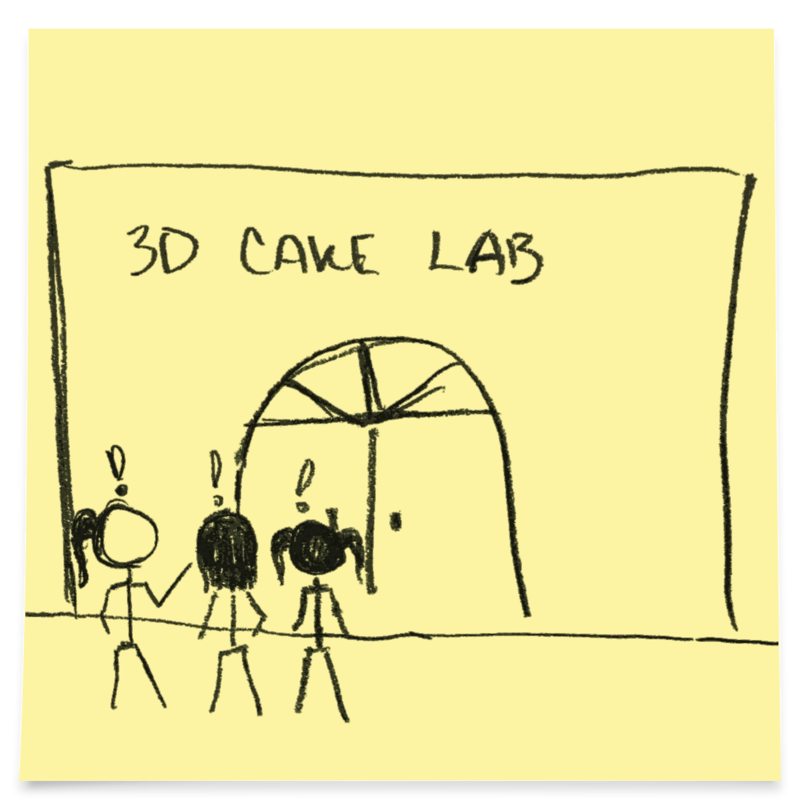 “3D Cake Lab…?” They were attracted to the modern design of the cafe. There were no waiters to serve them. Rather they had a big iPad in front of them. On the interface, there were all different 3D shapes on the right side of the screen. Catherine dragged one ball and two pyramids to create a shape of cat. Lisa and Amy also joined the design. They changed the color of the cake to pink and typed “Happy Day” on the surface of the cake. After pressing the “submit” button, they received their order number. 15 minutes later, the iPad vibrated. They were then directed to a 3D printing machine. They couldn’t believe their eyes. 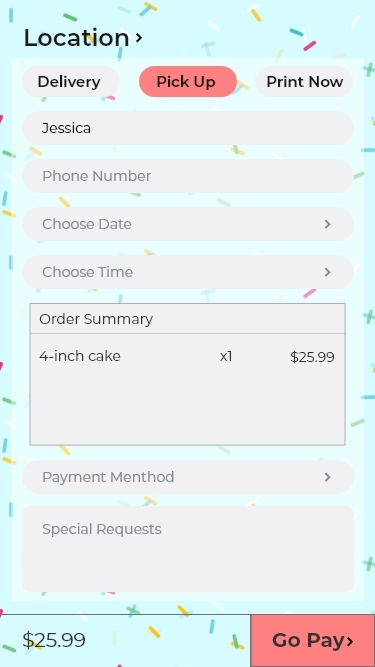 What they have designed in the App was actually being printed out as a real cake!!!!!! They brought their cute cake back to the table. They celebrated their friendship. 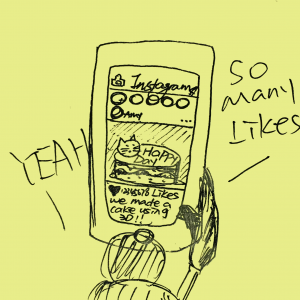 They took a picture of the cake a selfie, and then posted them on the Instagram. In just 30 minutes, they have received 12 million likes! What an amazing day! Half of the participants are interested in design/DIY, art, technology, and digital products. They are the target group that has higher possibility for using our product. It shows that most people purchase cake on special date such as birthday or anniversary to someone they really care, like their parents, friends or lovers, which indicates in some sense that the customization may be a good option for those people in these occasions. Top three considerations for people when they purchase a cake are taste/flavor, design and price. This result help us position our product to provide customers with choosable flavors, self design and reasonable price. 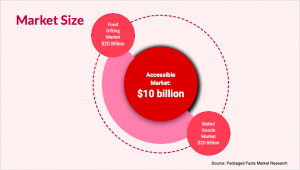 It also support our initial hypothesis that design really matters in bakery sector. 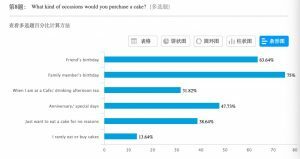 We are glad to see that more than 70% of people are willing to pay extra fee for the customization option with average 83RMB premium. 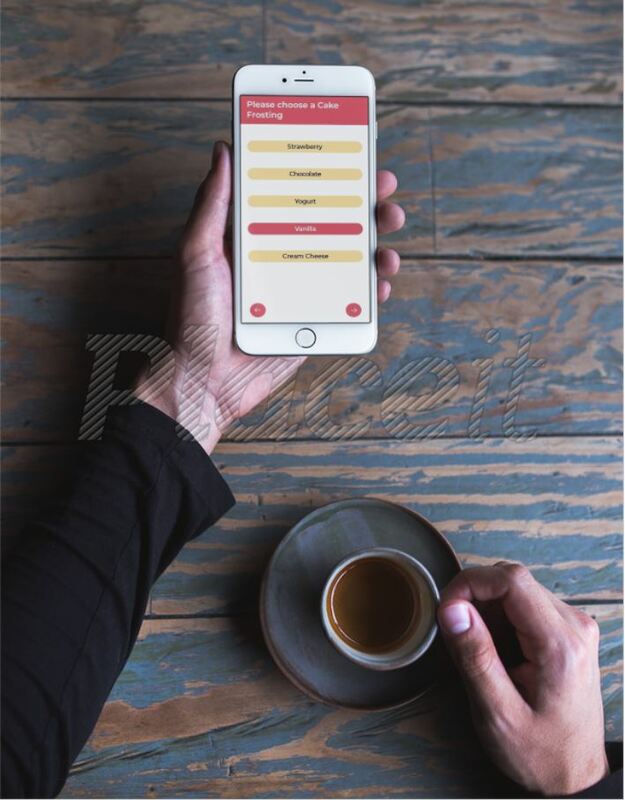 In addition to the survey, we have also conducted interviews with people about this application and they all show pure interests in our product. 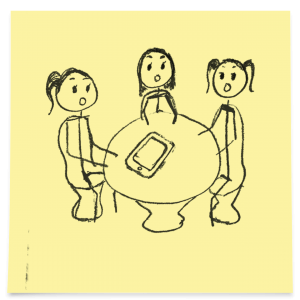 The interviews help us consolidate our belief that this product is actually helpful for most people. It is almost their 5th anniversary. Michael has been searching around for the best place to celebrate their anniversary. Michael is such a crazy worker that he hardly has time left for his family. He really needs an amazing date to cheer his beautiful wife up. Money is not a big problem for Michael, a banker. 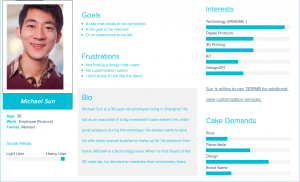 He wants the date to be the combination of his interests in technology and his wife’s love in design. 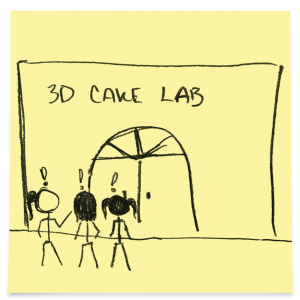 Then 3D cake lab becomes his optimal choice. Michael and his wife Susan walked into the mysterious modern cafe called “3D Cake Lab”. They were assigned to a beautifully decorated couch with an iPad on it. The interface asked them to “Start Your Design” with a simple click. Then they were led to choose their cake size, layers and flavor. 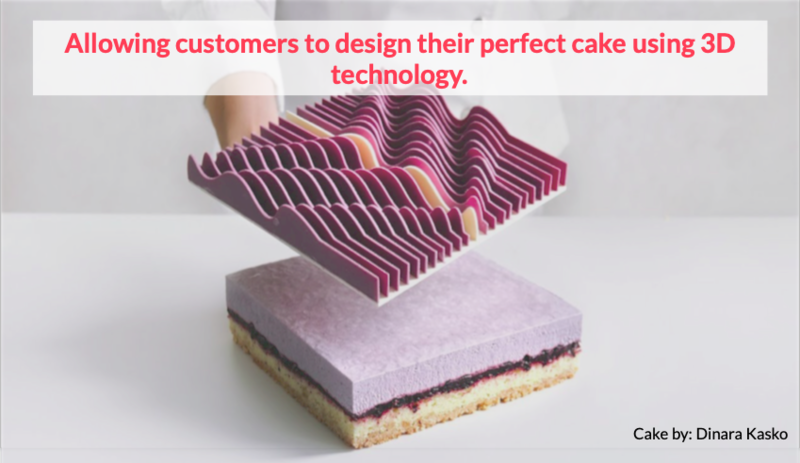 “6 inch should be enough… honey you like chocolate, lets choose the chocolate base flavor.” After they were done, a magic 3D modeling design interface appeared. There were tons of different basic 3D shape on the right side bar. Susan was very excited about the designing process. She expertly dragged a ball shape and two pyramids to create a shape of cat. She happily played with the different characters, colors, and texts. “Happy Anniversary!” Michael added the text on the top of the cake with a beautiful font and a rosy color. Then they were asked whether to upload their design to the big screen in the cafe. Susan clicked “YES!”. 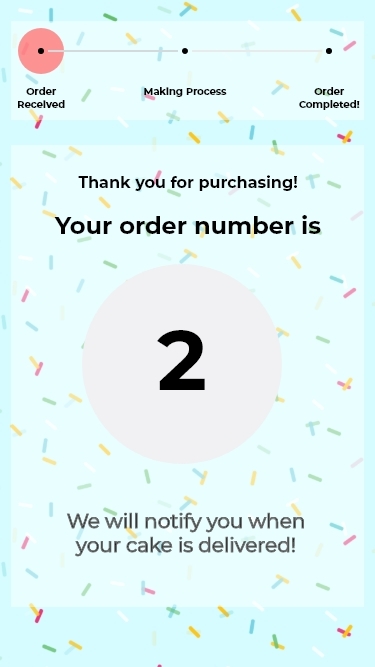 “I want to share this beautiful moment with everyone here!” They got an order number and was told by the interface there were only 3 more orders before them. After 15 minutes, the iPad vibrated and made sounds. They were instructed to go to machine No. 12. 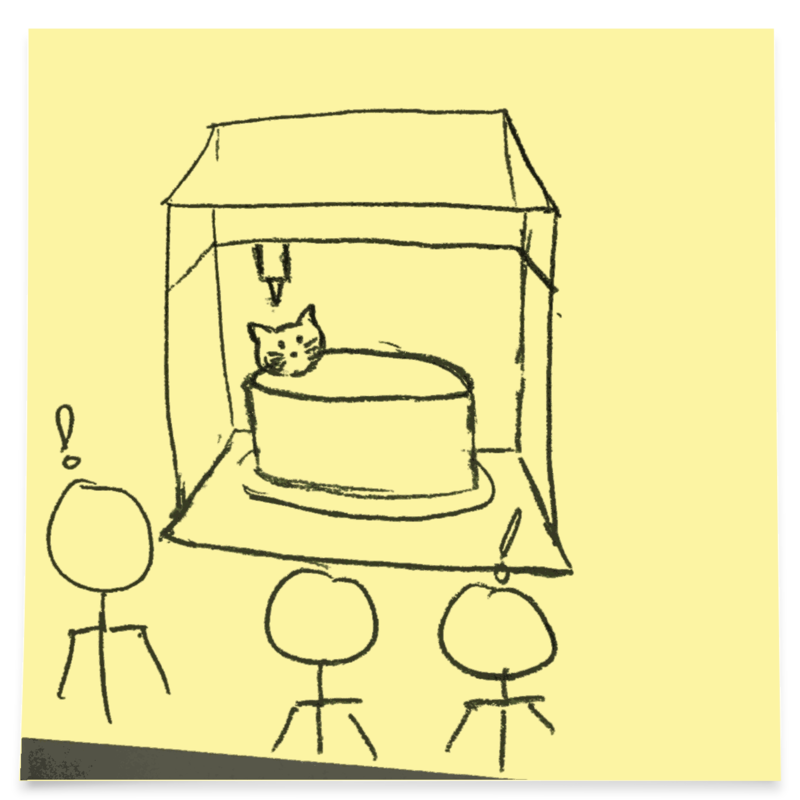 Michael couldn’t wait to show Susan the most cutting-edge 3D cake printer. They ran to the machine and saw the cake being printed out. “It is so amazing！This is the best anniversary I have ever had！ I love you Michael！” Susan said. 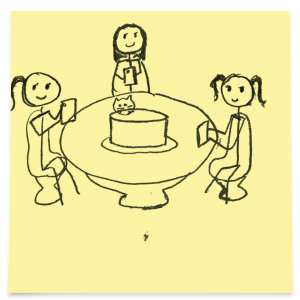 Jessica and her friends feel like it’s a waste eating their masterpiece, but they take a bite and decide that they’re definitely coming back again. 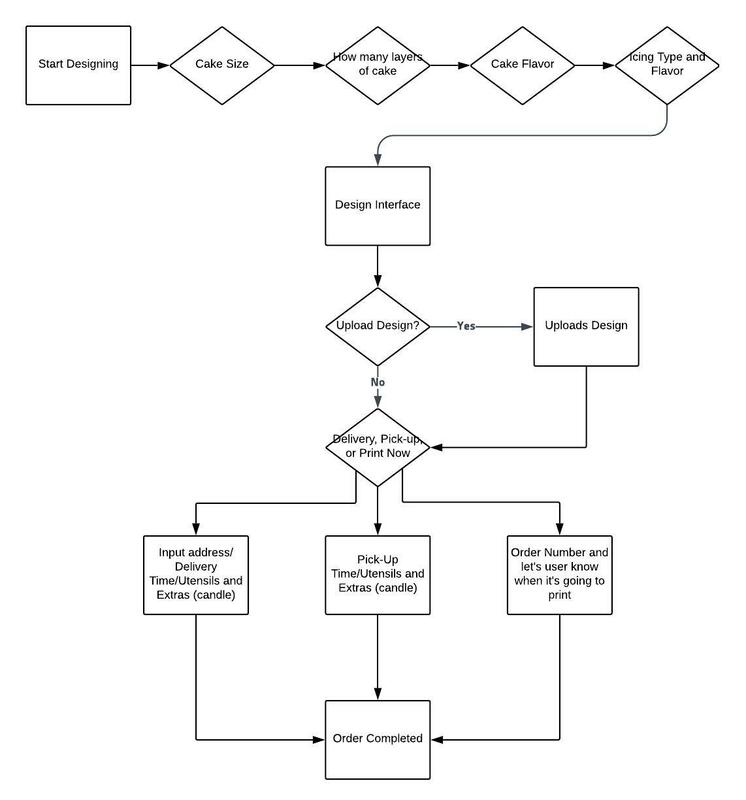 As is shown in the user flow, we want the customer to choose their cake size and layers first and then direct them to the main design interface. When the user finish their design, they will have the option to upload their design into our global design library or rather directly go to the payment page. 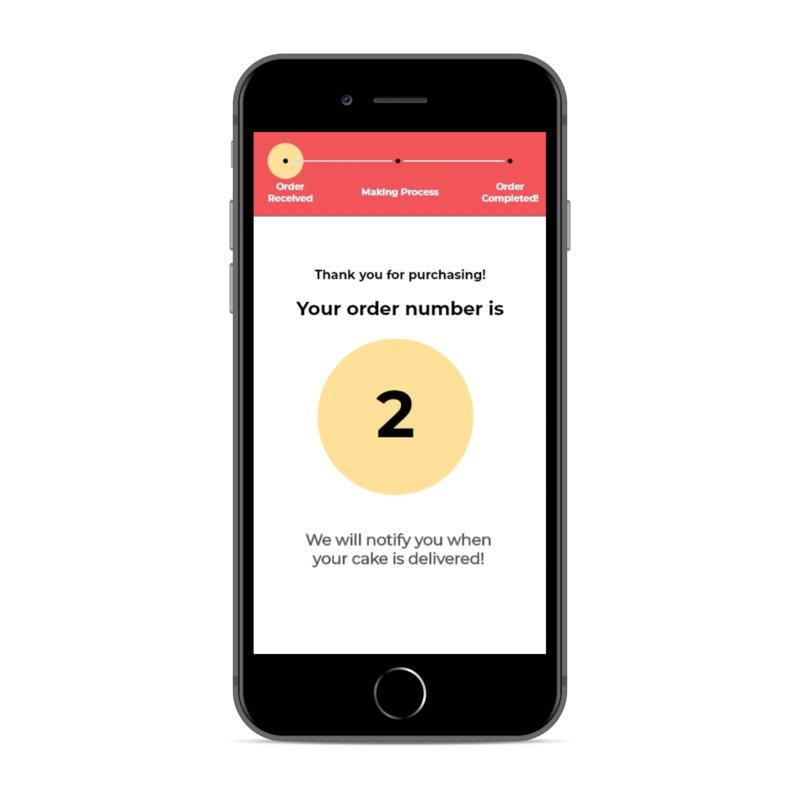 In the payment page, they would choose to either deliver the cake to their home, pick up in store in a future time, or print it out now. 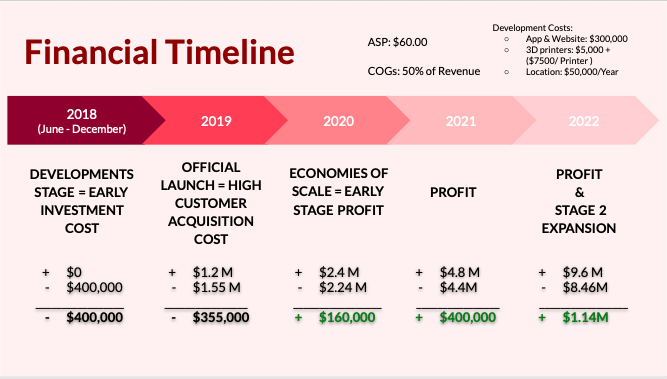 Based on Prof. Azure Qian’s feedback on our project, we have further brainstormed on the business model of the product. Since the major problem of this product may be the customer retention problem. 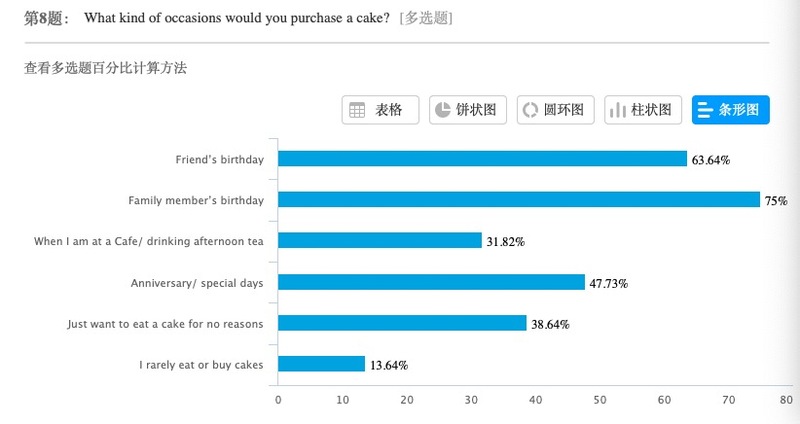 It is a common concern that people may only buy cake once or twice a year. In order to make the business have continuous profits, we have added additional features. As is discussed before, users have the option to upload their design to our global library. 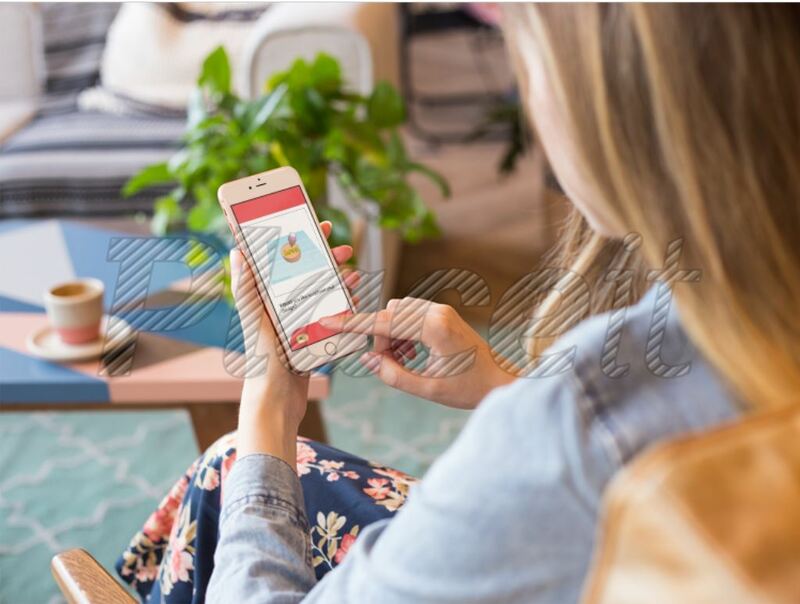 At the same time, users with less or little background in design and art can easily browse our online design library to choose others’ designs. Once a person’s design is used by others, he or she would get noticed in our App and gain membership points. We would also announce the winner of our monthly best design and give out coupons for buying cake or having afternoon tea in our 3D Cake Lab cafe. 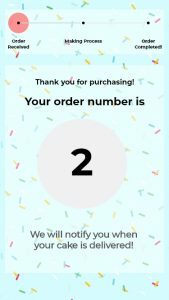 By doing this, users with no cake-buying need may also use our Apps during free time and upload for the chance to win our coupons. They would also be stimulated to buy our cake and experience our cafe. 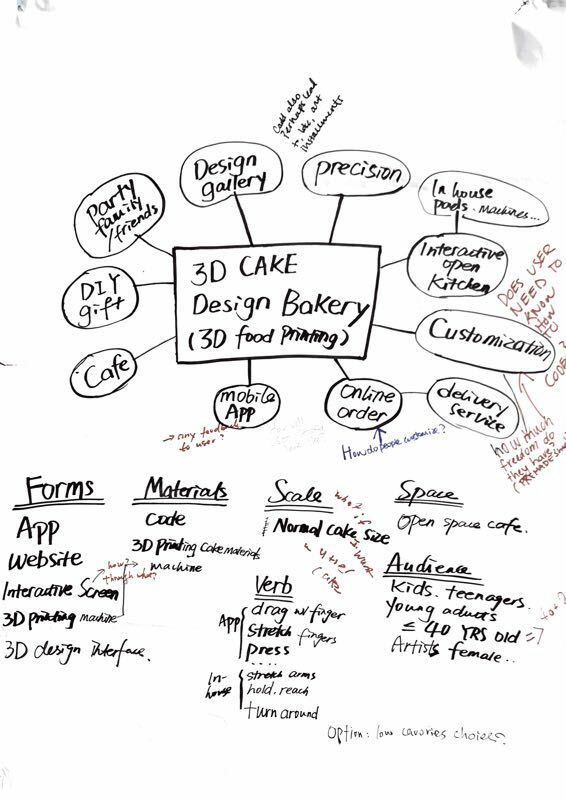 One important component of the our business apart from the 3D cake design App is our physical store – the cafe. 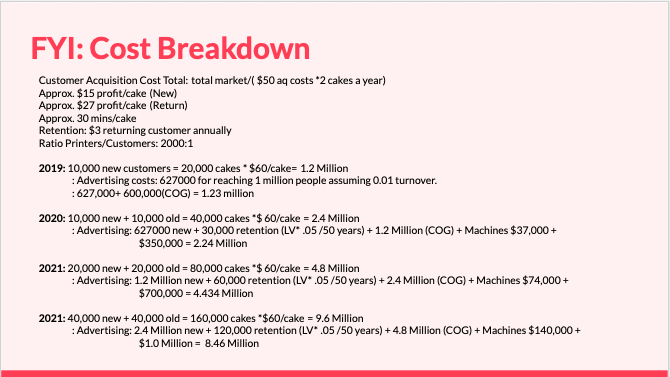 Our revenue would not only come from customers who buy birthday or anniversary cakes, but also customers who spend their leisure time with friends and family in our cafe with interesting human-machine interactions. We would further provide smaller-size dessert cake for those customers to eat while drinking their afternoon tea or coffee. We would take advantage of today’s online platform and have social media influencers to experience and advertise our product. 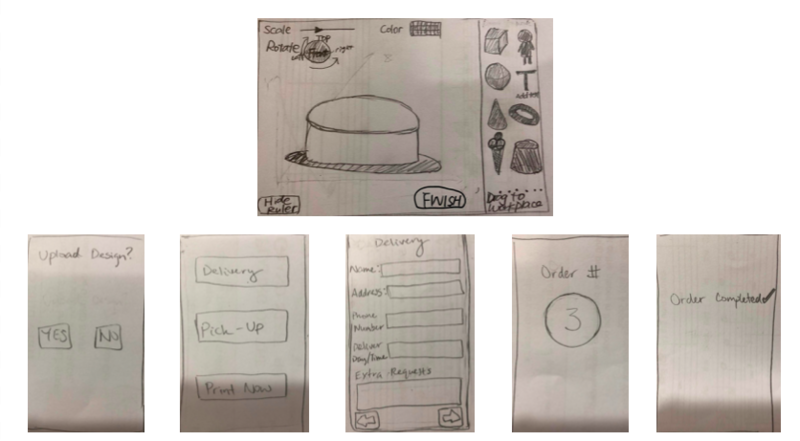 We designed our first version wireframes using pencil and paper. 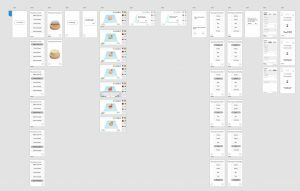 We used Marvel to make these wireframes interactive and did our first round usability test. 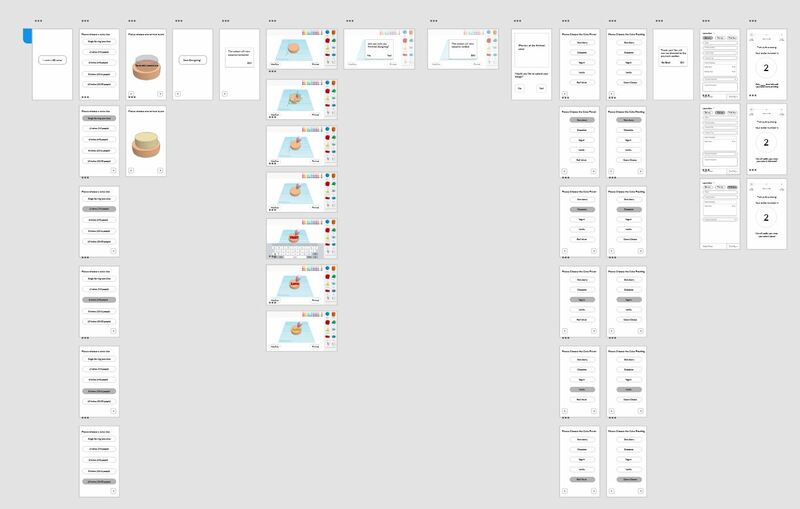 Based on the result of the usability test, we designed our second/final version using Adobe XD. To align with the topic of cake, we decided to use blue and pink as our main and secondary colors. 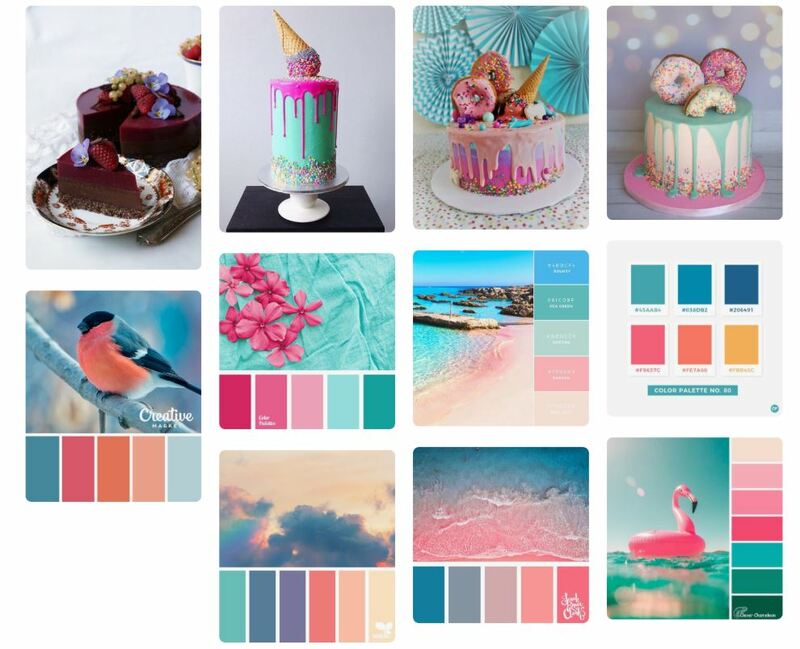 We chose our two colors from color-hex.com/color-palettes/. The hex values are #D6FCFF and #ff8080. 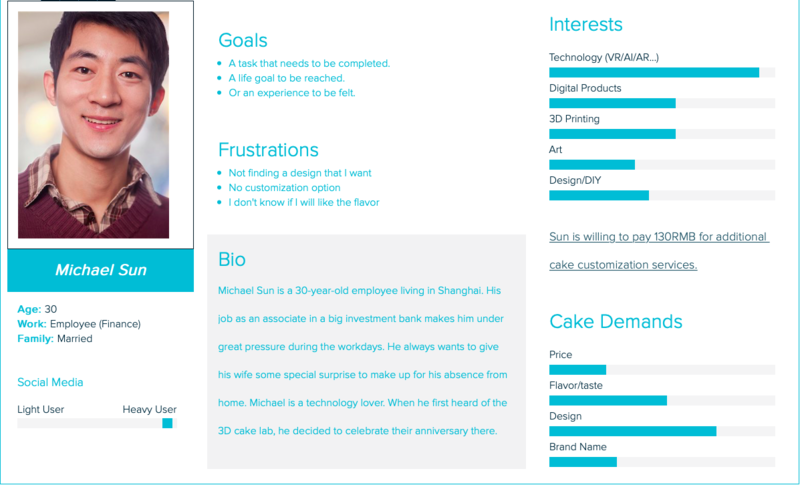 We also used Piktochart to edit our interface background. We added the effect of colorful short lines because it resembles the toppings on a cake. 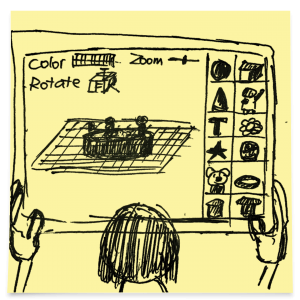 However, during the in-class discussion with professor Azure Qian and another designer, they pointed out the problem with the visibility of our background color. 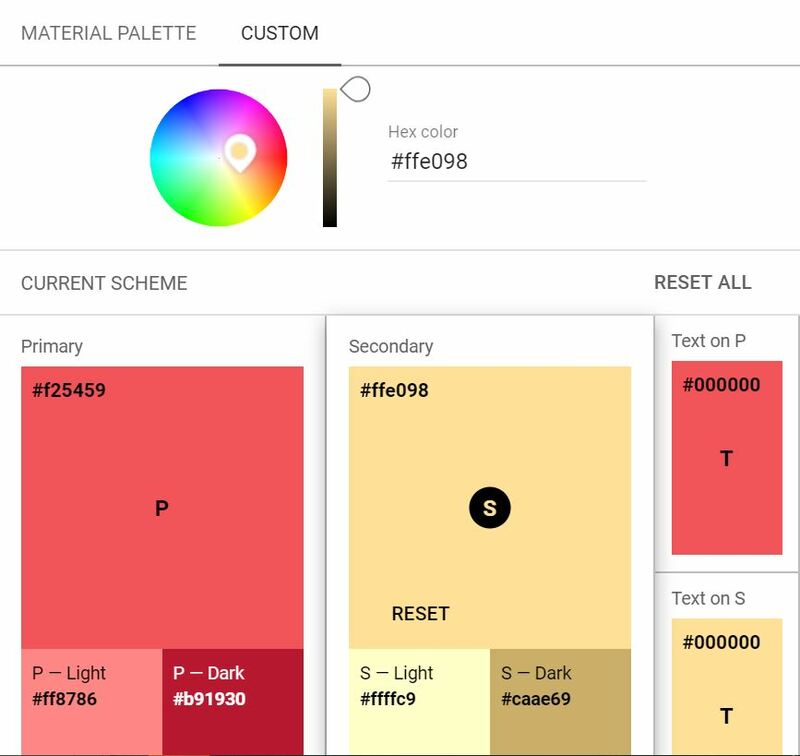 According to their experience, App design usually use colors with higher saturation. The blue color is definitely too light as our primary color. Besides, the gray bar doesn’t have that clear contrast with he background, which makes the text not clearly visible. Taking all these feedbacks, we have designed our second version mockup. We decided to go with the pink color as our primary color for the cake theme and searched the color palette on Dribbble. The logo is a 3-layer cakes with a half donut. It resembles the character 3D. 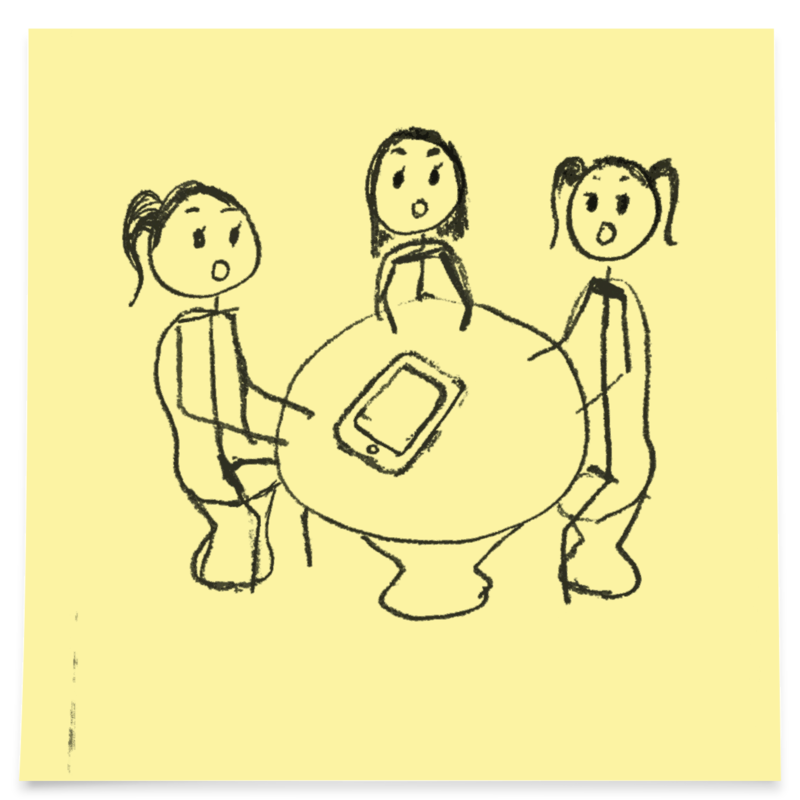 Some really important feedback were given through user testing especially on our first prototype. 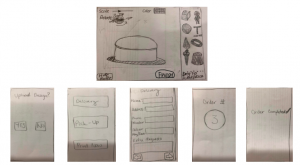 In our first prototype, the option to choose the cake flavor and frosting was at the beginning and each in a separate page. 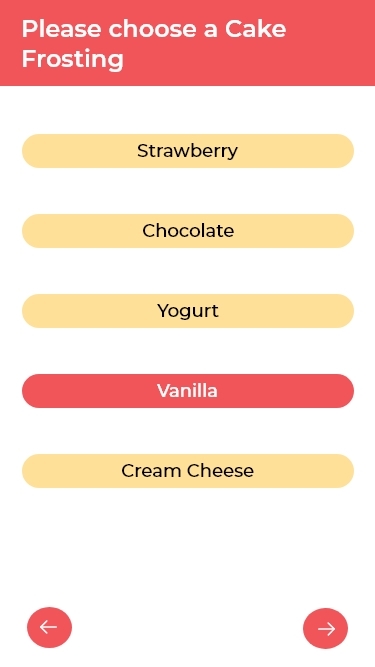 Some users were concerned that towards the end if they wanted to change the cake flavor or frosting, they’d have to go all the way back to the beginning and lose progress on other choices. 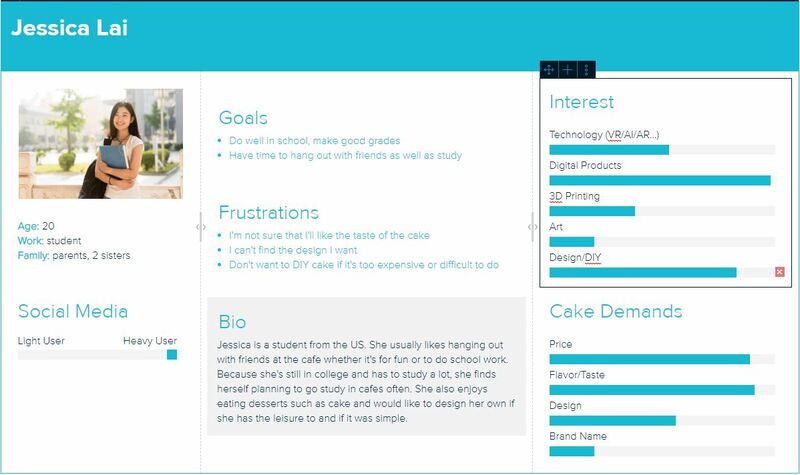 On the design interface, some users also preferred to have already finished designs as options to drag and drop on the cake rather than design the entire cake from scratch. Users also pointed out that there was no payment page on our first prototype. 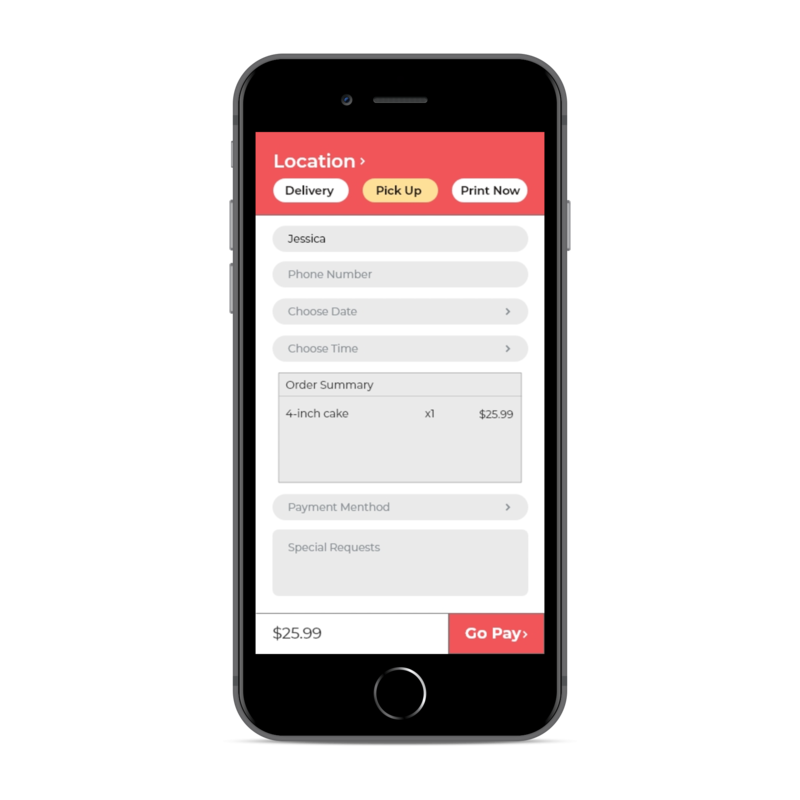 We then incorporated a payment page and the delivery section on one. Overall users said our app was generally easy to understand and navigate. We did another round of user testing on our second prototype. We have received many feedbacks and good suggestions for our 3D design interface. A common impression of this interface to users is that it is childish cartoonish. 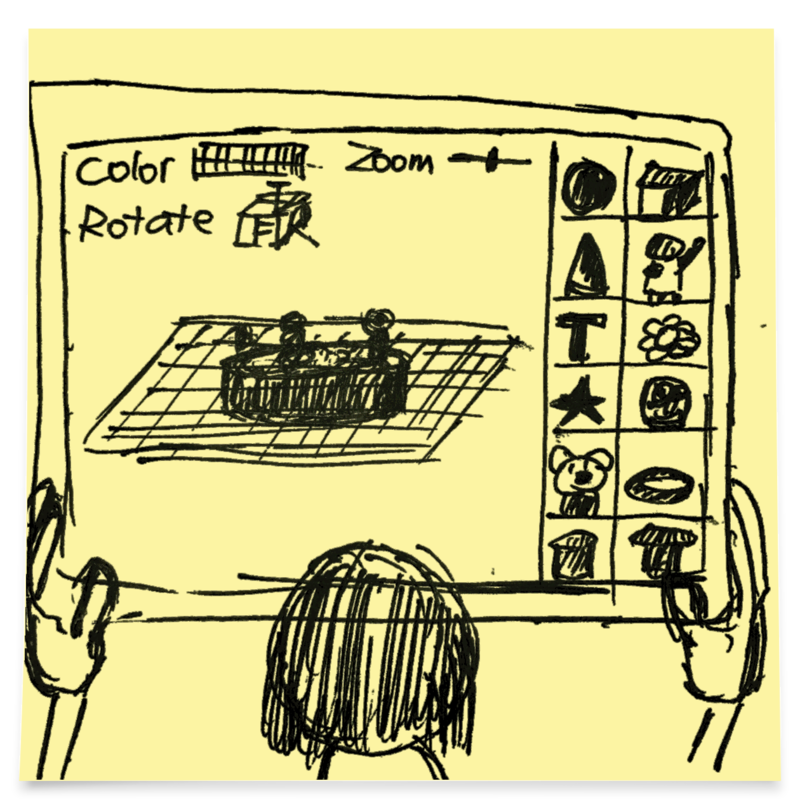 They could immediately be indicated that they were supposed to tap and dragged the basic 3D shapes to the interface. However, some have concern that they couldn’t properly position the shapes on the cake. 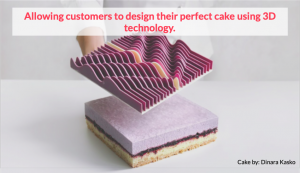 And it would be better if there’s an auto-filling options, like cube holes on different places of the cake for user to put in the shapes they chose, which could give them a better proportion and position which is aesthetic. 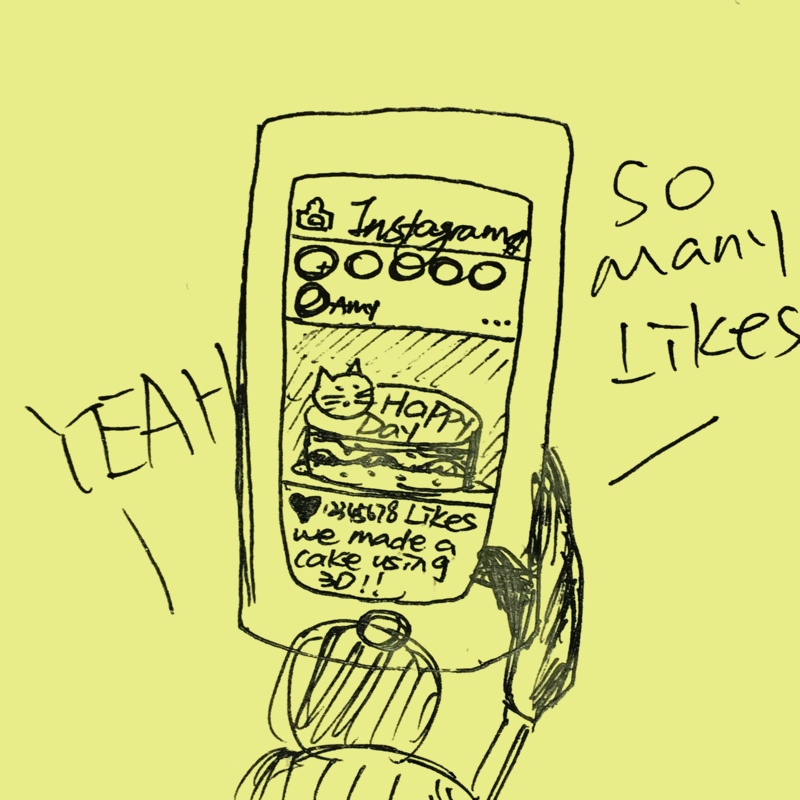 Some also suggests to change the interface to be more realistic, like a real cake. 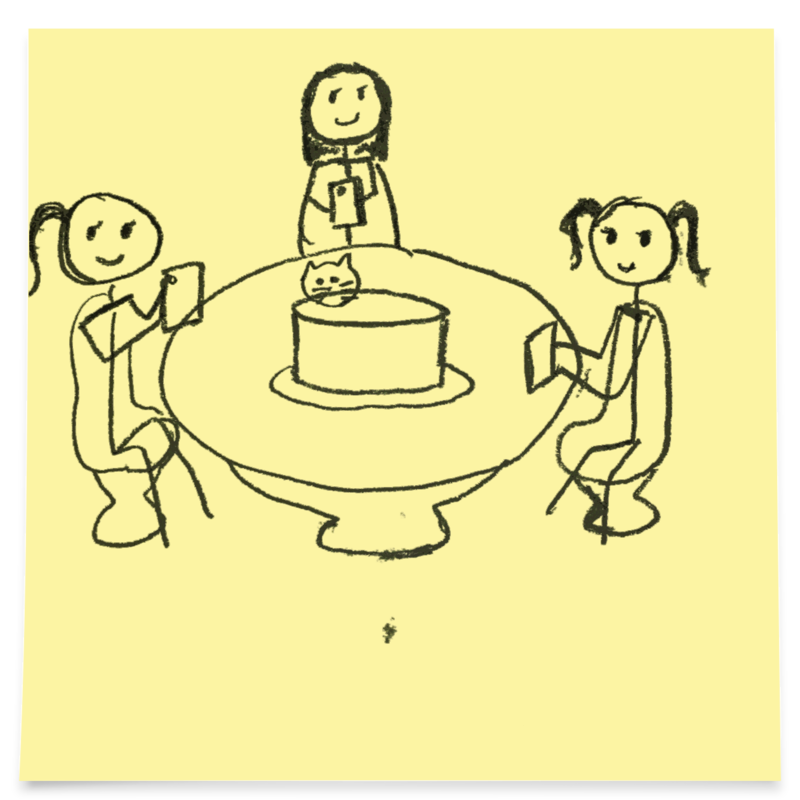 Users have the concern that a cartoonish interface may be misleading and they want to know how the real cake look like. They suggest that the 3D shapes on the tool bars should also look like realistic cake components. 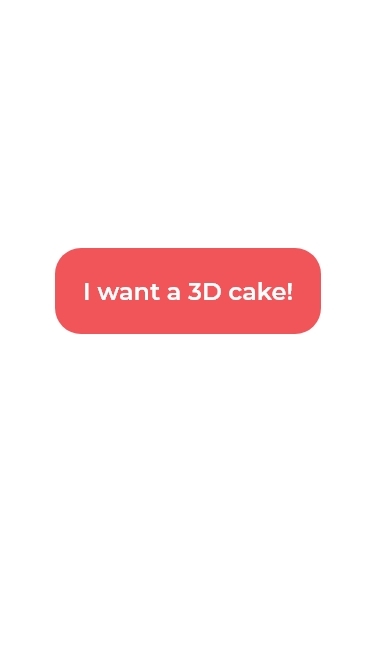 Another suggestion come from the users is to have a search bar on the top of the 3D shapes tool bar for users to type in the shapes they want. eg. flowers, dogs, etc. Special thanks to my instructor Prof. Azure Qian and my partner Theresa Lin.